Readers of this blog will know that I am a HubSpot Partner and I offer the platform as one of my solutions. This does not mean that all of my customers use HubSpot nor does it mean that I think every online business should use HubSpot. Part of my job is to help my customers analyze their situation and find the solution that will be right for them. That solution may be HubSpot or it may be Google Ad Words or a WordPress website. There are a number of blogs that have addressed this question and several have gone into a feature by feature comparison. I am not going to go into that much detail here but I’ll give you the links to those blogs below. WordPress and HubSpot are tools and like all tools the valuable tools get the job you need done. If you have a flat tire the nicest wrench set is not going to help you if you do not have a jack and a hand cranked jack will lift your car just as much as an hydraulic jack. When you put up a business website you use the tools available to achieve your online business goals. A business selling online jewelry will have different business goals and a different tool set than a million dollar consultant. But your knowledge, skill-set and resources may also influence your decision. A master chef can probably make a great omelet with an old frying pan and an electric plate. The chef can do a lot more with a kitchen set up with the tools and utensils the chef needs. If I were put in that well stocked kitchen I would probably still burn the omelet so I should be left with the electric plate. The amazing thing about WordPress is that it is free. You can also get for free, or for a very low price, just about any plug-in or widget for WordPress that will enable you to do anything you want to do online. WordPress is very versatile and with some HTML skills or by purchasing a specialized WordPress theme you can make your site look amazing. All the tools you need to do any of tasks associated with inbound or online marketing can be added to your WordPress site. You can connect MailChimp to WordPress for email and a newsletter. There are plugins for Customer Relationship Management (CRM) software. Plugins will help you optimize your webpage for SEO or you can add a paid service such as SEOmoz. And we should not forget that WordPress is one of the web’s most popular blogging tools. Notice that I did not say plugins can be “easily added” and the best tools are not usually free. Certainly there are easy and free plugins and WordPress tools but for the most part if you need to do serious work you need to spend a lot of time or spend some money. For example Google Analytics and Google WebTools are very powerful, free tools that give you deep, analytical information about your website. Most website owners I’ve talked to have not even put the tracking code in the website never mind delving into the reports and tables. If they do they concentrate on useless metrics like how long someone was on a page. You can also pay between $99 and $499 a month to have a tool like KISSmetrics help you track and interpret this same information. Even if you are not a chef it sometimes helps to have a small pan and a large skillet in the kitchen. It would be even better if the kitchen utensils were labeled so you knew the best pan to fry an omelet or sauté some vegetables. That is what HubSpot does. It puts the tools you need together and integrates them in a way that it is easier to tell what you should do and what is working. For example when I look at the report that tells me how many people came to my website it also tells me why they came. Did they come because of my Facebook post or because they were searching for a keyword? Do I sell more products when people are responding to a tweet or an email? To top it all off the report is in color so for my simple mind, I can get a visual snapshot almost immediately and delve into the details when I can. If you are just going into the kitchen to boil an egg do not bother with HubSpot. At the end of six months you’ll be looking at your bank account with a negative balance and you will be frustrated and angry. If your goal is to make beautiful websites that amaze the eye and stimulate the senses do not bother with HubSpot. Not that you can’t make beautiful websites on HubSpot but that is not its main purpose. If you want the freedom to build anything on your website with any tool you choose then do not bother with HubSpot, you may find it too restricting. If you just need a static website to act as an electronic calling card, then do not bother with HubSpot, it is overkill. If you have a small cash flow and no plans to use online marketing to increase business then do not bother with HubSpot because you will go broke. 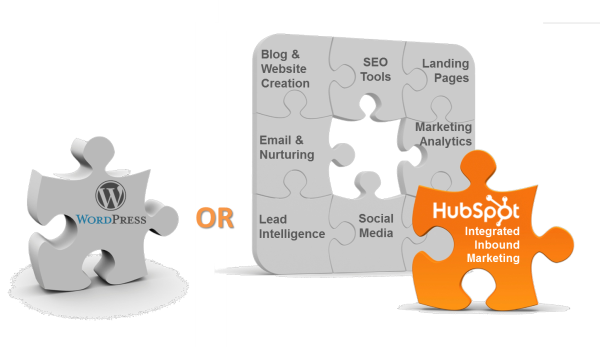 If you are a marketer or online business and you want to be freed from the burden of getting the information you need to make business decisions then consider HubSpot. If you want to know what marketing actions affect your bottom line then consider HubSpot. If you want tools you need in one place then consider HubSpot. If you want to concentrate on marketing and not web development then consider HubSpot. Marcus Sheridan is The Sales Lion and a small businessman who achieved a lot with HubSpot. He also has an extensive background in WordPress and his two blogs, The Most Important Customer Review of Hubspot You’ll Ever Read and The Most In-Depth HubSpot Vs. WordPress Review Ever Written, go into a lot of depth with a feature by feature analysis. Zach Browne is an internet veteran with lots of experience doing custom websites and CRM deployments. His blog HUBSPOT VS WORDPRESS FOR SEO, IS HUBSPOT WORTH IT? is posted on his WordPress site. Adarsh Thampy is the Conversion Champ and another non-HubSpot user who goes into a lot of detail in his blog Hubspot Review: Should You Buy This Inbound Marketing Tool? A gret tool is on Viktor Nagorny's website: WordPress: A FREE Alternative to Hubspot. It lays out exactly what you need to have to match HubSpot’s functionality on Wordpress. At the bottom of this blog he has a quiz that will help you decide what platform to use. From my friend Doug Kirk, CEO of Optimize 3.0 we have #1 Reason Why Hubspot Doesn’t Work | Hubspot Fails| Hubspot good? Doug is a HubSpot user but has a great perspective on why it doesn’t work for many people. One caveat on these reviews, HubSpot keeps making upgrades and changes to its system. Many of these reviews were written before the upgrade to HubSpot3 so there have been many changes and upgrades to the HubSpot feature set. Tell me what your favorite platform is and why you prefer it in the comments section below. But take a look at the video from HubSpot.